I travelled to Cagayan de Oro because of an assignment and I spent my weekend there alone. The previous weekend, I went to Siargao by myself, too. I’m starting to embrace the notion of flying solo and it’s not really that much of a big deal for me anymore. I still prefer travelling with friends as I get to enjoy the company of other people. But this recent trip gave me another thought to ponder when travelling to different destinations as I spent this trip with another group of people; this time with a family. Feeling restless that I didn’t have anything planned, I Googled ‘whitewater rafting Cagayan de Oro’ to finally experience one of the more popular activities in the City of Golden Friendship. 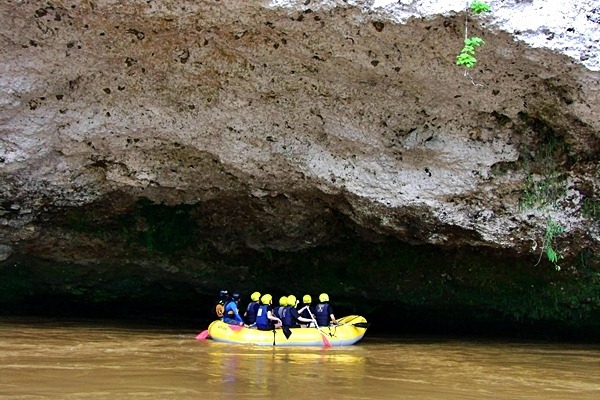 One of the websites that came up was that of 1st Rafting Adventure. I called them and made a reservation, hoping I could join a group that can accommodate one more head on their raft. It’s tough to get a good deal for packages when you’re alone. Luckily, I was given a go signal as there was an available slot with other companions the next day. Sunday morning, I bought a couple of bananas (at 1 Peso each!) so I could eat something while waiting for my jeepney ride. 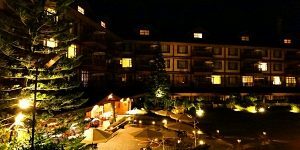 It’s nice that the rafting company will fetch you from your hotel/hostel and take you to the starting point of your chosen package. Boarding the jeep, I noticed 5 other people inside and initially thought that I was with college kids from town who were there for a vacation. I was right about the vacation; but they were actually a family from Manila. I introduced myself to break the ice and I got to know them a little more. JB just graduated from college, and his younger siblings are still in high school. Tita Eileen brought the family together for a vacation because she wanted them to experience the things they could do in Cagayan de Oro and its nearby places – they just arrived from Iligan and was heading to Bukidnon that next day. What was a 45-minute ride didn’t seem to take long due to our conversation. They were surprised that I was there alone, but they smiled at the thought of me joining them in this wild rafting adventure. Jerome, our river guide, educated us of the basics of rafting, how to use our paddles and what to do when we encounter the rapids. I took the Advance 2 Course because I wanted something more challenging. I would’ve taken the Extreme Course, but it was already off my budget. We started paddling and the main objective was to avoid falling. We were unsuccessful during the 4th rapid due to an unexpected 10-foot drop (see the video below). But it was exciting to be thrown into the river and get carried away by the water. The rafting adventure ran for five hours with a short lunch break in between. We managed to survive paddling 26 rapids. I wanted to bring a waterproof camera with me so I could document how beautiful the place was. I’m not that good at describing the view anymore. My words will become flaky if I keep using adjectives that have become cliches. Joining the Baylon family in this adventure made me a little awkward at first because I felt like I was invading their family affair. I was the stranger there but their actions showed that I was welcome even from the start. There was no “space” and any barrier between us was immediately crushed. I couldn’t thank them enough for their gracious welcome. “Join us.” Either of them said whenever our guides took their photos. Tito Jun stepped down from the raft in order to grab me so I could have a photo with his kids. Sharing a morsel of rice cake to taste if I also wanted one, grabbing me from the side in order to include me in their photos, or inviting me over for a late lunch after the rafting activity. 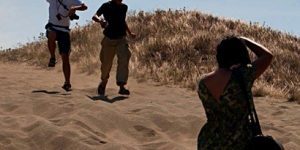 These were some of the instances that made me feel as if I was part of their family! I could also sense their closeness through their conversations between each other. Tita Eileen mentioned that I should’ve brought my friends along. I also agreed that the rafting adventure would’ve been a fun opportunity to bond with friends or colleagues. I explained that this was an immediate assignment so I wasn’t able to prepare for this trip; more so invite friends. But I was already glad to be with their company. This white water rafting adventure in Cagayan de Oro made me think about the last time I was able to bond with my own family. This is another project that I should be working on. Thank you very much Tita Eileen, Tito Jun, JB, Ise, and Ann! Photos are already part of the package, videos were taken with an additional fee. Thanks to Dodong & Kitot for taking our pictures! 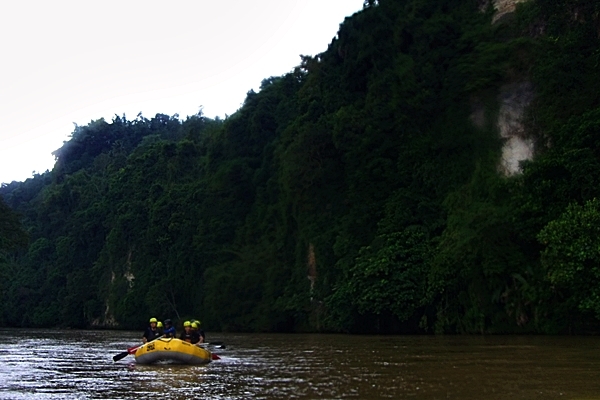 Check out the video below to see what you can expect from this wild rafting course in Cagayan de Oro. 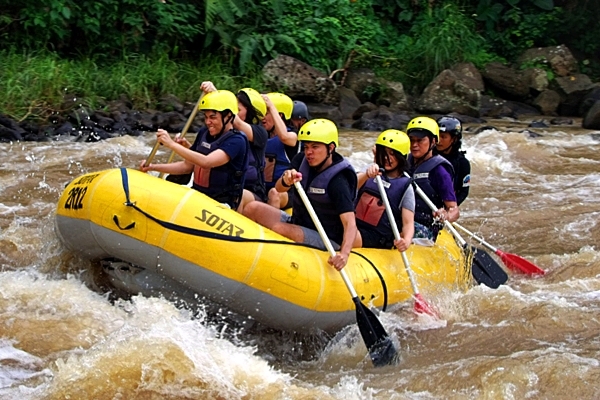 1st Rafting Adventure is the pioneer Whitewater Rafting in the Philippines since 1995. They have 4 courses offered: Beginners, Advance 1, Advance 2, and Extreme. Beginners is too easy and Advance 2 was just okay for a first-timer. If you want a challenge, go for the Extreme as you’ll trek for about 1.5 hours before getting to the starting point of the river. Thank you Rhossel, Kennie, Jerome, Vivien, Dodong, Kitot and the rest of the staff of 1st Rafting Adventure! It was an awesome experience! Thank you as well, to the Baylon family for your warm welcome! astig ng experience.. awesome din yung family na umampon sayo.. haha..
namiss ko naman ang white water rafting. It was my first rafting experience in CDO, after that nahook na ako hahaha…feeling ko ang galing ko na hahaha try Chico River at Kalinga and if mapasadya ka sa KK, Padas River naman! Naalala ko yung experience ko sa Apo Island few months ago nung meron ding "umampon" sa akin na family kase nagtitipid ako sa pag-rent ng bangka. In the end, pati lunch at pamasahe pabalik sa hotel natipid ko na din hehe. The videos are getting better and better. You got me LSS-ing on Naive. ay nakaka-miss nga. buti kayo naka avail ng video. Poorita mode kami back then. hahah! gusto ko rin yung extreme pagbalik ko. effortless sa pagtaob sabi nung mga guides. first rafting din kami before e. at nagbubulwakang putik din ang tubig namin. hahah! Choco Water rafting. It's really fun no? mas ok sumama sa family kesa sa barkada pag solo. magkakasakit ako dahil hindi ako makakadaldal. this is why i strongly stick with my belief that kindness is innate in strangers. a very heart warming kwento! kakainggit! how much was the package that you availed Ed? Adventures like these are great fun and it's great to hear of families doing them together and welcoming you in. 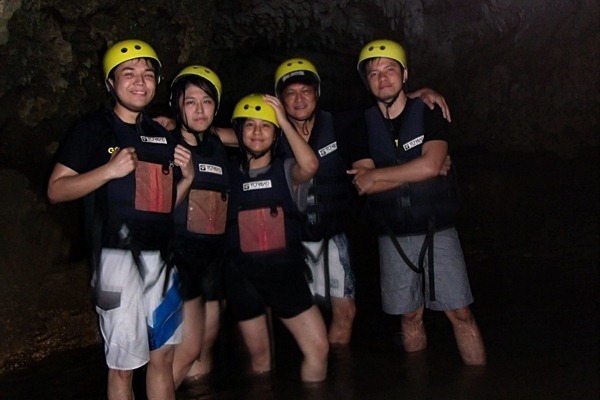 Things like rafting are often used for corporate teambuilding and it can have the same kind of effect with families too, like you say helping with bonding. Sounds like you had a great day joining in with them and became a part of their family this trip. Maybe next time if your friends can't make it you can get your family together! 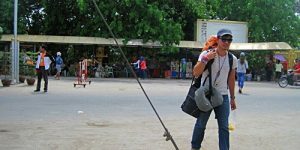 @ron: stories like these make solo travelling such a unique experience. thanks! @Stuart: Yes, I initially thought I was going to spend this rafting adventure with a group in their team building exercise. But it was still an awesome experience being with this family who welcomed me with arms wide open. 😀 thanks for dropping by Stuart! You look like you had a great time. I'm so jealous of you because I love whitewater rafting. 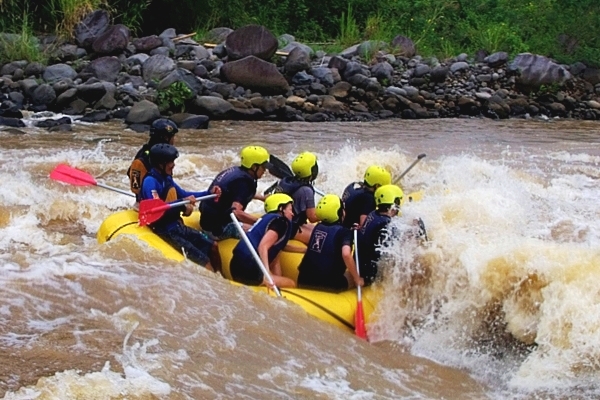 Your adventure reminds me of the last time I went rafting in Costa Rica. It was such a beautiful river and fast rapids. I almost fell into the water a few times. Our guide must have felt confident in us because he had us all stand up and lock arms into a circle over one rapid. Amazingly, none of us fell in. I'm glad the family accepted you and you didn't feel excluded or as an outsider. Weeee! I'd love to do this! Hey Ed, how much did you pay for the video? OMG I'm envious! Gotta try rafting next year! This looks exciting! team work is fun in an activity like this. Another great adventure! @ken: hi Ken, it was around 250 pesos additional I think. It depends with the company. 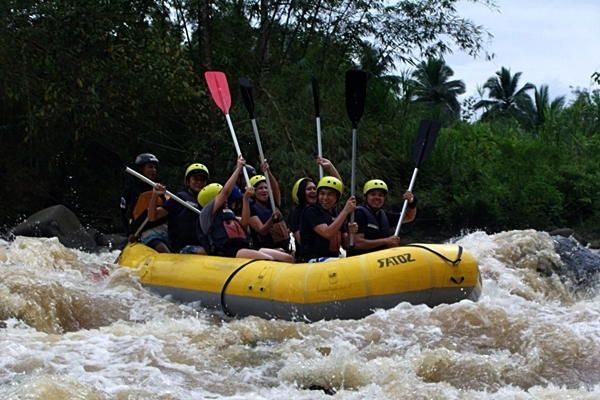 inggit naman ako sa yo.i lived in cdo before pero never ko na try yang rafting na yan. I havnt tried this yet ed. We are just near from here. :-). @josiah: yeah, I think you'll have lots of opportunities to meet new friends kasi isasama ka talaga nila sa isang grupo pag konte lang kayo. thanks josiah! @AJ: lol, kung ganun man, 3 years old na palang ako nagpakasal na. lol. natawa naman ako sa comment AJ. hahaha. @bonzenti: next time sir, I'll drop by Bukidnon! Lloyd mentioned that it was a blast to hang out with you guys! The rafting seems so exciting to try! The vid make it really enticing to try. It's so much fun to water-raft with friends but then again, doing it solo and meeting 'friends' is a different experience altogether. We were there last August and we're planning to come back again. So heartbreaking to hear what happened to CDO. They need our help. You know me and how much I try to avoid extreme adventures like this. But after reading this post, those pictures, and watching the video, I think convinced na ako to try it out when I get the chance. It looks fun and exciting!!! Also, I'm not surprised at how that family welcomed you like it wasn't a big deal. Friendly and approachable ka naman kasi Ed…. tsaka madaldal. Hahaha. @robbie: naks, wow! napaconvnince ko ang isang travelling dork sa pagtry nito! really great feeling when things like these happen (inspire others to try out different adventuers — perk ng blogging. hehe). naks, ngayon mo lang nalaman na madaldal ako rob? hehe. matagal na toh, shy lang ako sa simula. hehe. Ed, how much rafting sa kanila? our family will be there by Feb. Is it safe kaya with my parents to try it out? I like them to try the adrenalin rush while conquering those rapids! hehehe..Safe ba if nahulog dami ata bato? thanks. And one more, it took 5 hrs ang adventure sa rafting? tama ba ko…. anyway, nice vid. Excite tuloy ko.. So yes, I believe it's pretty safe for anyone who's fit to white-water raft. Haha, Thanks Mach and Ed. You're right, walang challenge nga if advance course. I am more concern lang with my parents and Tita. But I think as what have you both shared with me, I think we're gonna make it! thanks and Happy Holidays! yeah, Hopefully, the soonest it will recovers! I wonder… Is this river affected by the disaster in CDO? @byron: Not too sure, will try to contact them. But from what I read during a forum in PinoyExchange, there were groups who were able to try this adventure recently (mga 26th of Dec). 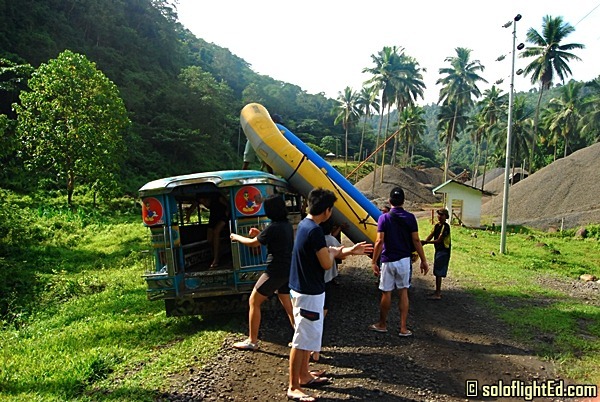 AFTER THE TYPHOON "SENDONG" DEVASTATED CAGAYAN DE ORO CITY AND ILIGAN, A LOT OF PEOPLE ARE ASKING IF IT IS STILL SAFE TO GO RAFTING, THE ANSWER TO YOUR CALL IS YES! 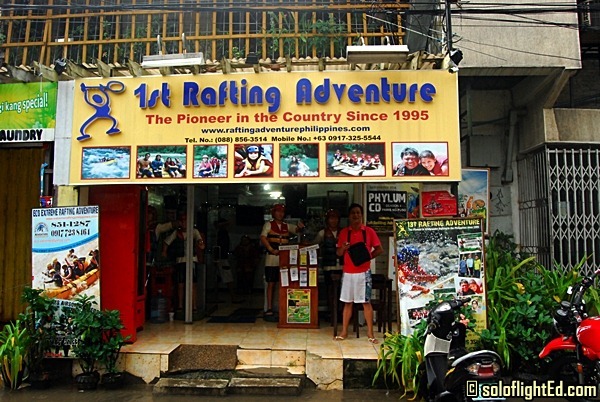 1ST RAFTING ADVENTURE AND ECO EXTREME RAFTING ADVENTURE RESUMED LAST DECEMBER 26 UP TO THE PRESENT. ALTHOUGH THE GEOGRAPHICAL FEATURE OF THE RIVER WAS TOTALLY BEEN CHANGED IT IS STILL SAFE TO GO WHITEWATER RAFTING. MORE FUN AND ADVENTURE. WE HOPE THAT YOU CAN SPREAD THE WORDS SO THAT WE CAN COPE UP WITH THE DAMAGES AND LIFT THE HAPPINESS OF TOURISM AND THE RAFTING INDUSTRY IN OUR CITY. 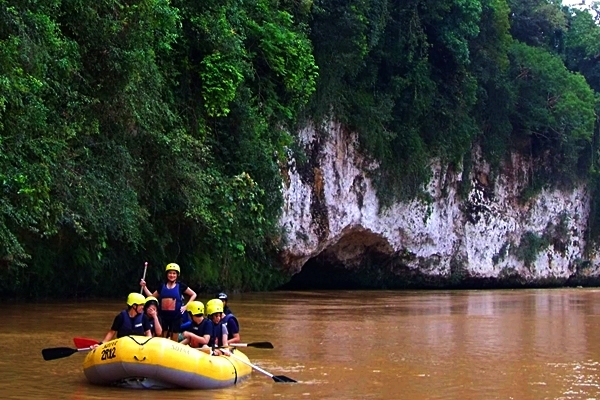 River rafting is a must when you visit Cagayan de Oro. You can also explore the city for fun and food. 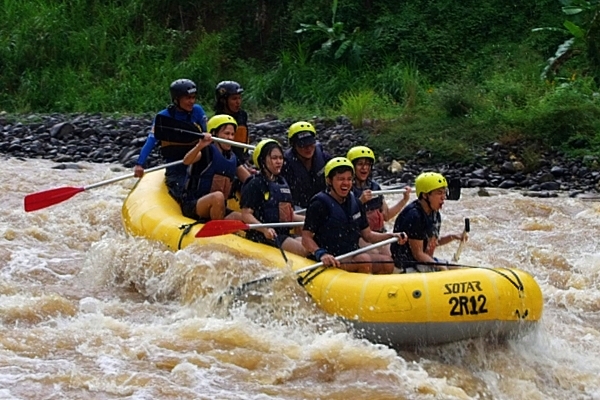 Indeed, CDO is the City of Golden Friendship and the famous white-water rafting even made that true to you. Fun and new friends in one good adventure. 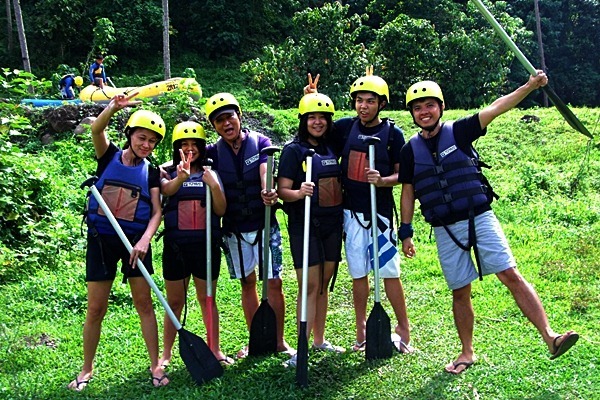 We will be having our first white water rafting this August, kasama pamilya ko. Just by reading your experience and watching the video, lalo tuloy akong na excite. hehe! We tried whitewater rafting (through a different provider) and it was super awesome! We took the advanced course, but we felt we needed a little more thrill and excitement.